The Labyrinth mind mapper lets you collect and organize your thoughts and ideas without major detours. Gathering and structuring your ideas is not always easy. Many people find a blank sheet of paper useful for jotting down their thoughts and brainstorming results. But, if you want to play with the products of your imagination or have them handy at some point in the future, your most effective option is mind mapping (see the box "Stroke for Stroke"). Mind mapping is a cognitive method for organizing thoughts, structuring topics, planning actions, or just taking notes. In principle, the technique does not involve any major hurdles: You take a sheet of paper and write down the central topic in the middle; then, write down the next thought that comes to you and connect it to the central concept with a line. Next, you jot down all the other terms that you come up with and connect those with lines to the related terms that already exist on your paper. In this way, a kind of map of your thoughts – a mind map – is created for the central topic. Software such as Labyrinth  hugely simplifies the process of creating mind maps by first helping you collect the ideas and then saving the structures you developed for a new session. If necessary, you can edit the graphic by colorizing individual nodes on the map or adding images. Labyrinth also lets you change the elements in almost any way to obtain a new perspective on your "mental landscape." If you use a different distribution and cannot find the program in the package management tool, you can download the application source code from the project website  and build manually. 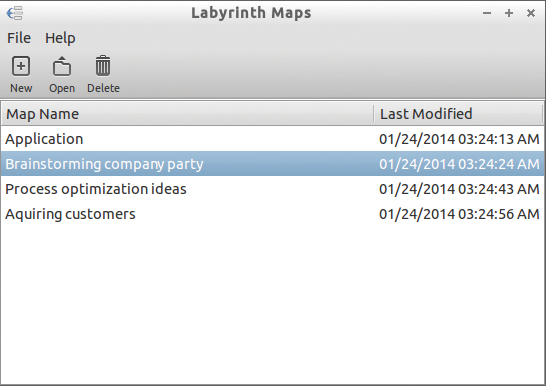 Labyrinth starts up with a small program window in which the tool automatically stores and lists all newly created mind maps (Figure 1). Labyrinth handles the process of saving, so you will not find a Save function in the menus. Figure 1: Labyrinth collects all the mind maps you have created in a small program window. To create a new mind map, simply click on New, which opens another window. You can then edit the data. All the required functions are available in toolbars (Figure 2). Figure 2: A new mind map in Labyrinth uses a separate window, which offers all the existing functions in a clear-cut way. In the top bar, you will find the tools for editing the mind map, along with the zoom and undo functions. The bar at the bottom of the window contains formatting options for fonts and graphical elements. To draw a new node, you must first enable edit mode, press the button with the pencil icon in the top bar, and click on an empty space in the mind map. The insertion point then appears, and you can enter text. The text ideally should be short and concise. When you are done, simply click in another place and enter the next node. The connecting line between these two nodes is drawn automatically by the program. If you require a different connection starting from a particular node instead of the connection drawn automatically, first select the node to which you want to attach another and then click on an empty spot. Pressing Ctrl+L lets you connect nodes that were not previously linked. This process also opens up the option of linking one node with several others by first selecting multiple nodes. If you want to remove a connection again, use the same keyboard shortcut. After drawing a few nodes, it is often useful to optimize the mind map by moving the individual ideas to appropriate locations. To format texts retrospectively, double-click the corresponding element to switch it to the appropriate mode. Once you have selected the text, the options for formatting become available at the bottom. To make an easily legible mind map, the text for a node should not be too long. You might find it helpful to use the expanded text function for explanatory comments either from the View menu or with Edit | View Extended, depending on your installation. You can enable this in the View menu. Then, expand the window with the mind map to the extent that you can see the input field for the additional notes at the bottom of the window. Before doing so, select the desired node. A picture is worth a thousand words; thus, it makes sense to present complicated issues in a mind map not with text but with an expressive drawing. Labyrinth gives you the option of inserting graphics instead of text. Adding pictures is basically like adding texts; however, you first need to select Mode | Add Image, or you can click the button with the green plus icon. Next, click in a blank area of the mind map. 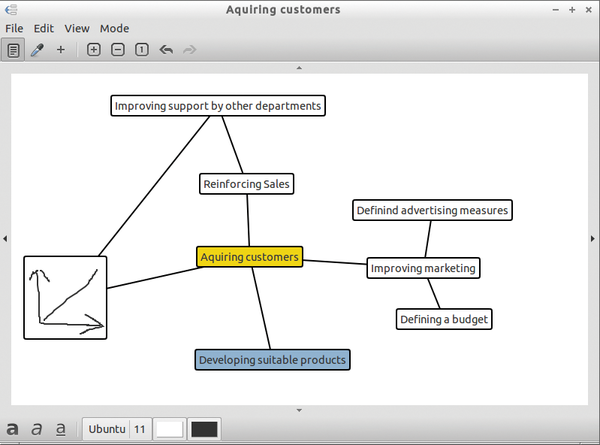 The program also lets you create small drawings within the mind map. You can access this function by selecting Mode | Drawing Mode. To insert a drawing box, just click on a blank area. The drawing box is very small initially, but as soon as you begin to draw beyond the boundaries of the box, Labyrinth grows the frame to match. It thus makes sense to first adapt the mind map window to the space you actually need for the drawing. Learn how to master the advanced features of the FreeMind mind-mapping application to get the most out of this useful tool. View Your Mind lets you draw and manage mind maps that can help you structure your thoughts and ideas and record notes. Mind mapping programs let you visualize projects and plans on your PC. If you want to work more efficiently, you'll want to keep the free XMind for Linux in mind.